Secondary students from the French and International Streams have worked on the theme ‘A Sense of Place’. Students from BPR and TKO quatrième classes gave their version of the Bank of China or HSBC towers, incorporating in their composition on a circular format other buildings of Hong Kong, and creating a special atmosphere by using color, transparency and rhythm effects. Students from troisième classes approached the theme by choosing the image of a place of significance for them, evoking emotion, feeling, awakening memories or suggesting a vision of the future by stimulating the imagination. Their production is done on canvas board, with mixed techniques, around the collage of this photo. This is an opportunity to work in painting, to look for nuances, to interpret ideas through color, layout and the choice of the media used. 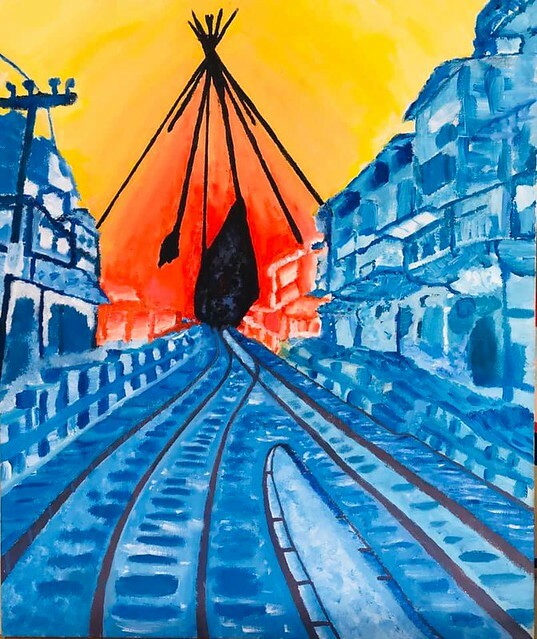 The high school students of the 2 sections and all registered in optional art, worked on the notion of belonging to a place, on a canvas or wooden panel. From photographs of a special place in their heart and for which they feel deep feelings, they illustrated various places, sometimes close but often distant, a place where they feel at home! Their inspirations were numerous, filled with memories of scents, colors of cities or islands. Art House 2019 will make you travel till Paris, Quimper, Hong Kong, San Francisco, Kyoto, Neuchâtel, Boracay and many more others locations, passing by l'île de Ré, Singapour or Moscou. The exhibition is open to everybody during school hours. We wish you a nice visit! Art Week is coming now at TKO and this year the theme is “Black and White”.